This is a re-posting of my 2009 Eurotrip journal. I am revisiting it in order to split the long original post into smaller parts that will fit more neatly into the country categories of the top menu. I also wanted to restore some images that were lost when I imported my old blog to WordPress. but I thought it was a nice choice for kicking off the journal. This journal chronicles my trip to Europe from April 4th to April 12th, 2009. First, a little background. My Uncle Kipp is a high school German teacher who takes his students on biennial Spring Break trips to Germany through a tour company called ACIS. As group leader, his trip is free, and he is allotted a certain number of chaperones, who also get to go for free. This was my second trip with one of his classes (I had also chaperoned two years ago). As with the previous trip, I paid extra to be guaranteed my own room, so my trip ended up costing $280, which is still obviously an enormous bargain for a trip to Europe, and more than worth it to have my own room for the week. After packing all night and getting little sleep, we left the house around 12:45 p.m. for Gateway high school in South Jersey. The airport shuttle arrived at Gateway a little after 2 p.m. and, after saying our goodbyes to family, we were off. We breezed through check-in at Philly airport—and I wasn’t searched for a change! The flight did not leave until 6:15 and we had some time to kill, so I watched the Star Wars episode of Family Guy on my iPod. Also during this time, I learned how easy it is to misplace your passport as I had a brief panic attack when I couldn’t find mine (it was under the seat I had been sitting in.) It would not be the last time on this trip that I would have a passport snafu (more on that later). During the flight, Lufthansa serves food and drinks (all free). The dinner was actually pretty good for plane food and I had a few glasses of white wine to wash it down. The woman sitting next to me was nice and we had a good conversation for the first half of the flight. She was headed to Germany on business for Siemens. I tried to sleep during the second half of the flight to no avail thanks to the guy behind me kicking my seat the entire time. I finally gave up and decided to watch a movie. They now have touch screens on every seat where you can choose from a number of movies, TV shows, and music channels. The movies are edited for content, but it wasn’t too noticeable. I decided to watch Twilight (the first film had just come out) to see what all of the hype was about—there’s two hours of my life I’ll never get back. Anyway, we soon landed. I bought a pair of earplugs supposedly designed to help relieve the pressure during takeoff and landing, but they didn’t work; I pulled them out about halfway through the landing. Thankfully, I’m more of a veteran now and better at popping my ears on flights, but at the time it was only my second flight in 20 years. We arrived at Frankfurt airport around 8 a.m., met up with our tour guide, Keith, and hopped on the ACIS bus. The other two groups had arrived before us, so there wasn’t much choice in terms of seating (it would be the first salvo in a week-long battle for seats on the bus). 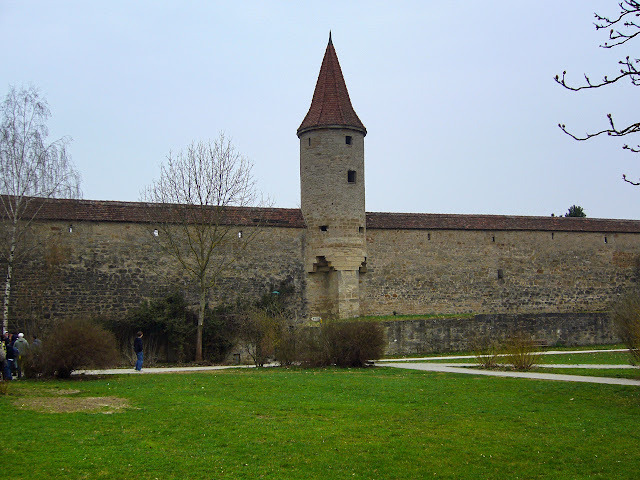 The drive to Rothenburg, a charming medieval town surrounded by a perfectly preserved city wall, took around two hours. I was finally able to check into my room around 4pm, at which time I crashed and got about an hour of sleep before dinner at the hotel. Dinner that night was decent, a beef pot roast. 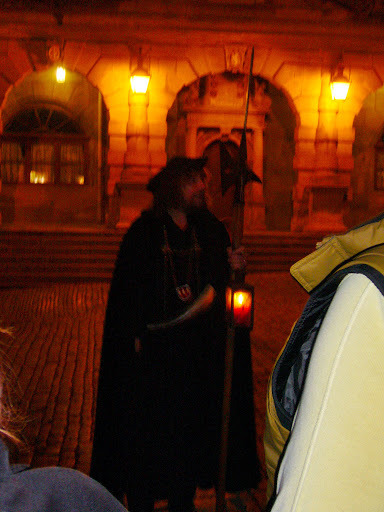 That night we walked back into town for more gelato and to see the town crier, who was dressed in full period costume. That day we had some free time before leaving town, so I walked around Rothenburg by myself. First I toured the historical museum in the town hall devoted to the 30 Years War, which had a cool dungeon complete with cells and instruments of torture. I also tried to climb the town hall tower to get a bird’s eye view of the city, but it was closed for the day, so I did some shopping and then ate at the same restaurant where I had the great meal the day before. This time it wasn’t as good, but it was still okay: a pork chop, sauerkraut, and my first beer of the week. Later I bought a chocolate covered snowball (a local specialty for which I cannot remember the German name), and soon after we were back on the bus for Munich, which will be covered in the next installment. Until then, I’ll leave you with a couple of night shots of Rothenburg.